Blac Chyna, a business mogul and model, has sparked controversy with her latest business venture involving skin-bleaching products. 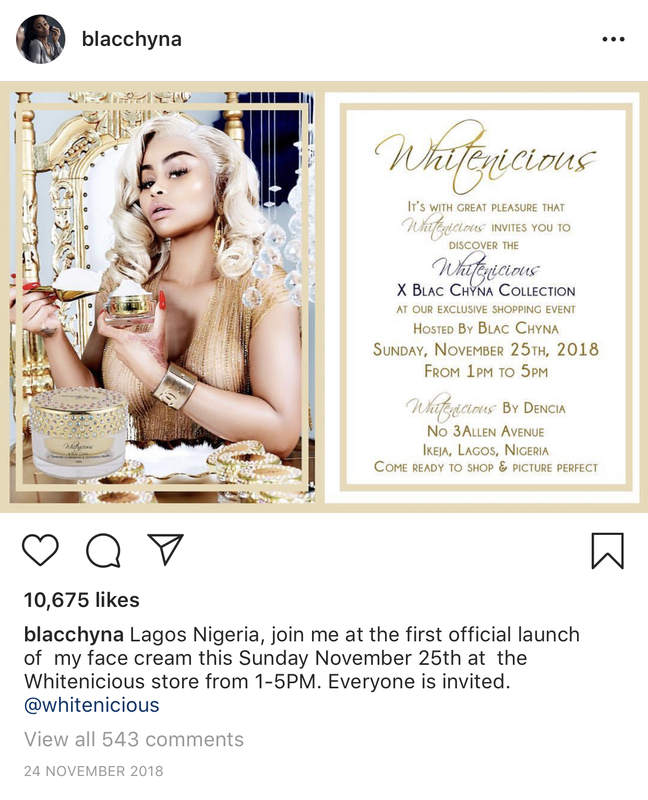 In November 2018, the celebrity launched ‘X Blac Chyna Diamond Illuminating and Lightening Cream’ in collaboration with the brand Whitenincious to be distributed in Nigeria. The $250 (£195) ‘illuminating and brightening’ cream, which comes in a crystal-adorned jar, was classified by the company as containing no bleach and is marketed for individuals struggling with discolouration and hyper-pigmentation. Nonetheless, the product could be used for other reasons, as it challenges the on-going “colourism” epidemic in Nigeria. Whitening and bleaching products in pharmacies are often marketed at a low bracket price-range, so the price of the Whitenicious cream being retailed at $250 (£195) was conflicting for individuals. Dencia defended the cost by claiming the product is a ‘luxury product’. 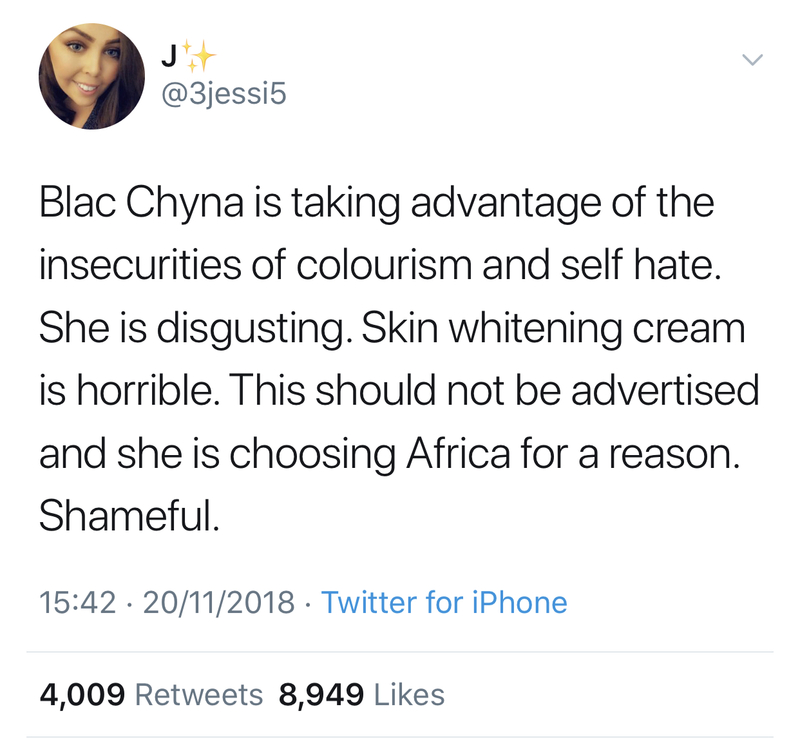 Skin bleaching products are not prohibited in Nigeria, although harmful side-effects have been shown. According to the World Health Organisation, 77% of women and men use skin lightening products on a regular basis, with the dream of being fair-skinned. Nigeria currently has the world’s highest engagement with the practice, in comparison to 59% in Togo and 27% in Senegal. Whitenicious products can be purchased legally in the UK, although most skin-whitening products cannot. Many creams containing chemicals such as mercury and hydroquinone are banned by the EU under safety guidelines. The chemicals, if used in a prolonged manner can be hazardous to an individual’s skin, and can cause medical side-effects such as liver and kidney malfunction. These creams containing should only be prescribed by a doctor under steroid medication. Many skin-whitening products used outside the EU aren’t safely regulated and may contain poisonous ingredients. The primary concern is that the women and men using them are unknowingly thinning their skin and causing internal damage to their body. The targeting of Nigeria with the knowledge that it has so many people interested in bleaching their skin has enraged some online. Blac Chyna has been criticised for using her influential platform to promote a detrimental product that shouldn’t be ethically endorsed. 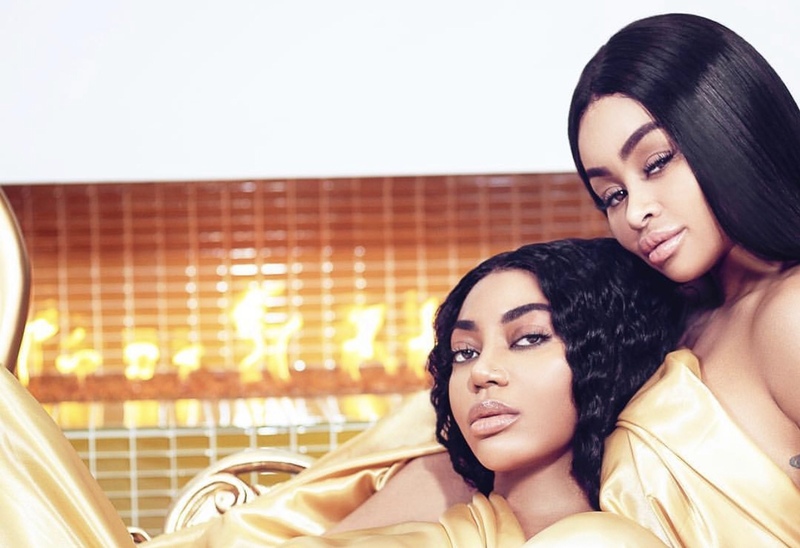 “Blac Chyna is in the position where she has people on her team who are skilled at pertaining to a specific audience. Her and her team preyed on the insecurities of Nigerians for profit. Nigeria has a history of colourism, where lighter-skin has been portrayed as beautiful,” Claire, 22, told us. Born and raised in Virginia, Claire’s family originates from Nigeria and she has seen how the skin bleaching craze has manipulated Nigerians and other Africans to trust that these products are healthy for them. In Nigerian films, known as Nollywood, Claire pointed to a large number of actors that have whitened and blemished their skin over the years. The video posted online was met with further hostile reaction and consequently made matters worse for Blac Chyna. 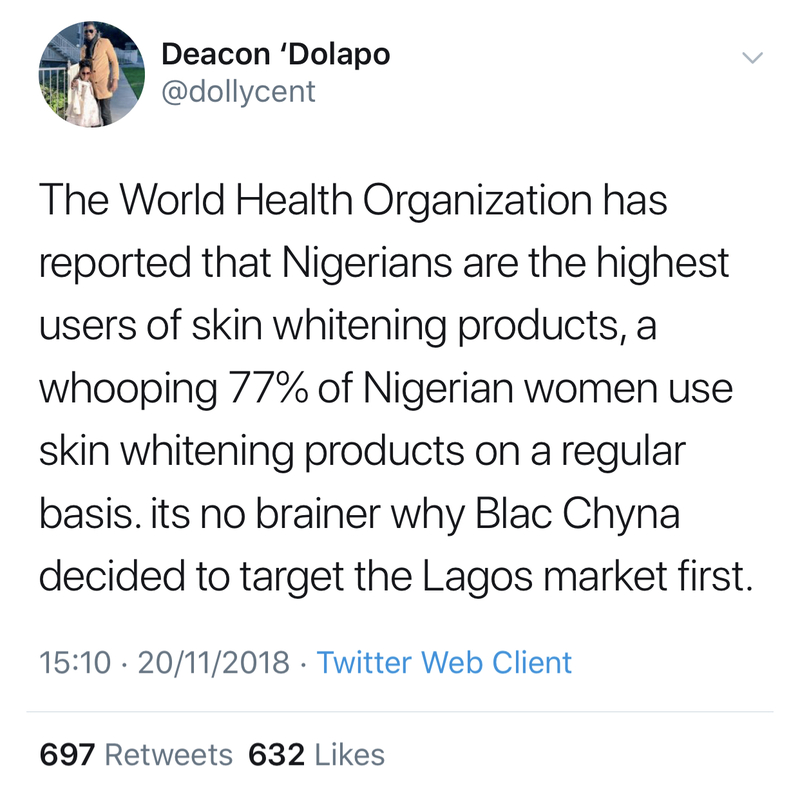 Unfortunately, Nigeria isn’t the only country to embrace skin bleaching products in its society. South and East Asian as well as Middle-Eastern countries also sell products which encourage whitening of the skin. In such cultures, skin whitening remains a common practice as dark-skinned men and women are often targets of prejudice and social bias. As a result of dark skin being perceived as undesirable, South Asian and African women are judged unmarriable, and their families are forced to pay high amounts of dowry for them to be wed. Both men and women go to extensive lengths to maintain a lighter skin-tone by staying away from sun exposure, regularly using whitening-products and using lighter shades of make-up to create a fairer-looking complexion. Luke Fuller, 22, went to Tokyo, Japan for his University year abroad, and found himself surrounded by, and unwittingly caught up in the skin-whitening epidemic. The student had suffered from eczema and had purchased a cream in a pharmacy that was supposedly subscribed to heal his condition according to research online, however, the cream contained a minute dose of steroids that consequently bleached his skin. Luke told us he was concerned that a cream containing steroids, that would require a subscription within the UK, can be bought easily in a Japanese pharmacy. He said that skin-whitening was a normalised fashion around him as he often saw women walking around in the summer with umbrellas to shield their skin from sun exposure, and he was unable to find a sunscreen with a UV rating lower than factor 50. Colourism has purportedly been fueled by Eurocentric beauty standards that the beauty and cosmetic industry has been pushing for years. A number of high-end cosmetic brands only cater to Caucasian and light-skinned women, and skin-care brands like Cremé De La Mer have ‘brightening’ products that are often used for discolouration and hyper-pigmentation purposes but are often exploited by their East-Asian market to lighten their natural skin tone. A former retailer at the French brand in Central London, who wishes to remain anonymous, told Artefact that a number of foreign customers would approach the counter and ask for the ‘whitening’ creams, mistakenly thinking that the brightening products contain regulated bleach substances. “When customers first asked me for these whitening products, I said ‘Sorry we don’t do these products?’ I was extremely confused, and then they’d point towards the brightening products we sell. I’d tell them what the creams are not for bleaching the skin, but they’d still buy it,” the 25-year-old said. An Indian beautician based in north London, however, has praised the use of skin-whitening products as it can be used to lighten South Asian’s dark body hair: “Yes whitening products can be used to lighten the body, but I mainly use it to lighten facial-hair and also revive sun-damaged skin.” The beautician uses OXYLife Crème Bleach in her salon and advises her clients to only use the product once every six weeks, when the hair starts visually darkening. Although skin-whitening is considered an unethical practice due to its harmful side-effects, it’s a profitable industry. In 2017, according to Future Market Insights, the Asian market is the most lucrative as it makes up more than half of the global market endorsing skin-whitening products – an estimated $7.5 billion (£5.78bn) out of $13.3 billion (£10.25bn). China accounts for about 40% of sales in Asia, Japan 21% and Korea approximately 18%. While it’s a lucrative and blossoming business, it’s at the expense of people’s health. Men and women, especially in Eastern countries, should be advised to champion their natural skin-complexion and not fall for Eurocentric beauty-standards that are advocated in their country. “Remember you are beautiful. There are people that wish to have your radiant complexion! Bleaching isn’t good for your health, and it is a horrible permanent solution to a temporary feeling,” Claire concludes. Feature Image by Blac Chyna on Instagram.